The vast majority of consumers now use the internet to make at least some of their purchases. That means there’s a lot to be gained from running an e-commerce store or creating an online presence for your existing business. However, the realm of e-commerce can seem vast and confusing if you’ve never sold anything on the web. Fortunately, there are plenty of comprehensive solutions that can help you get an online store up and running in no time. You’ll need to choose the best e-commerce tool for your needs, and you’ll want a platform that’s flexible, secure, packed with features, and easy to expand as your store grows. In this article, we’ll explore two popular solutions that may be just what you’re looking for: Shopify and WooCommerce. We’ll introduce both platforms, explain their major features, and compare them in a number of key areas. First, though, let’s talk a little more about the art of online salesmanship. Amazon is one of the largest and most successful e-commerce stores. An e-commerce website is any site that sells products and services — in other words, an online store. It could be a massive retailer such as Amazon or a small operation selling handcrafted items. It could also be part of a larger website, such as the stock photo repositories that are tacked onto many photography portfolios. Online stores generally have low overhead costs since you don’t have to pay for a physical location and can cut out many other expenses. You can reach a wider audience and make more sales as you aren’t limited to only serving customers and clients who can visit your store in person. Your store will be open for business 24/7, further expanding its reach and potential to attract visitors. It’s easier to develop a passive income stream — if you automate both the sales and fulfillment stages, you can earn money while you sleep! There’s certainly some initial work involved in creating an e-commerce store and an ongoing effort to run it. However, the potential returns make the investment well worth your while. If you decide that building an online store is right for you, the first steps you’ll need to take will be deciding how to host it and what platform it will run on. DreamPress is a quality, managed hosting solution that will help your online store thrive. Unless you have your own personal server (which is unlikely), you’re going to need a hosting provider for your e-commerce site. 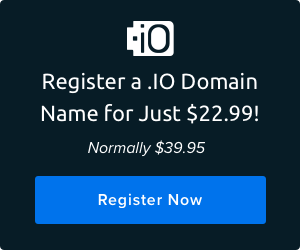 A web host connects your site to the internet and makes it available to visitors. Without a host, your site lives only on your computer. There are many hosting options available, and your choice will affect many different aspects of your site — so choosing a quality option is paramount. This is particularly true for an e-commerce store since your site’s performance and reliability will directly impact your customers’ experience. Performance — Your host affects the speed and reliability of your store, which can have a huge impact on your bottom line. Uptime — A quality hosting provider should work hard to ensure your site experiences little to no downtime because a broken site can result in lost sales. Security — It’s paramount to ensure the safety of your customers’ personal data so your web host should have a reputation for security. Support — When you’re running an online store, you want to know that you can get answers when you need them. Once you choose a web host, it can be difficult to switch to another provider — so it pays to make a careful and considered decision. If you’re building your e-commerce site with WordPress, we’d recommend our DreamPress service. 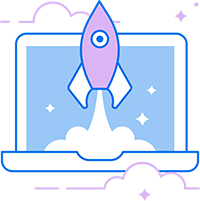 It’s a fully managed WordPress hosting plan that covers all of the important bases — performance, uptime, security, and support. WordPress is an excellent solution for building almost any type of site — including an online store. If your e-commerce business is going to be successful, you’ll need the best possible tools to build it. Along with your web host, the platform your store runs on will affect almost every aspect of its performance and functionality. And since migrating an already established store to a new platform is usually quite difficult, you’ll want to find the right solution to meet your needs from the very start. Specific features — It’s sometimes possible to add features your store is lacking after the fact, but your job will be easier if your chosen solution has everything you need out of the box. Flexibility — The more flexible your platform is, the more power you have to create the exact store you want. Scalability — Your chosen solution should be scalable — which means it should be able to grow along with your site and store. Security — This is important for any site, but especially for an e-commerce store where you’re handling sensitive customer information on a daily basis. 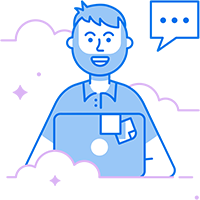 Support — Even with the best and most intuitive solution, you’ll occasionally have questions or problems so you want the team behind it to be available and helpful. Search Engine Optimization (SEO) — It’s hard to sell anything if no one visits your store, and a site that’s well-optimized for search engines should draw a larger audience. This may seem like a lot to ask for, but there are plenty of solutions that meet all of these criteria and more. Let’s take a closer look at two of the best and most popular. Among the many e-commerce solutions you can opt for, there are two that stand out for their popularity, flexibility, and feature set. We’ll briefly discuss each in turn and then go into more detail on how they compare throughout the rest of this post. First up, Shopify is a comprehensive e-commerce platform that contains most of what you’ll need in one simple package. It’s beginner-friendly and enables you to build and customize your own online store in very little time. You can then list your products and start attracting customers. You’re also able to handle multiple types of payments, fulfill orders easily, and even track various metrics so you can see how well your site is performing. There are a variety of affordable plans with differing feature sets. 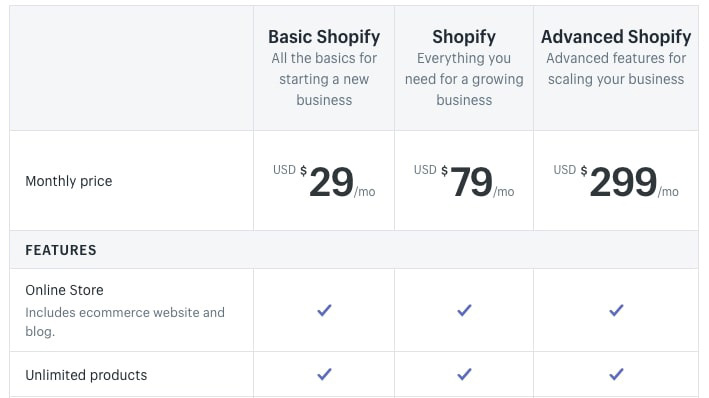 Shopify costs $29 per month for a basic plan. Good news for DreamHost customers: we make it easy to integrate your Shopify store with your site. Next up, we have WooCommerce, which is a little different. It’s actually a plugin for WordPress — a platform running more than 33 percent of the sites currently on the web. WordPress itself is a great solution for building an e-commerce website — it’s open source, powerful, flexible, and provides access to thousands of add-ons in the form of free themes and plugins. However, it doesn’t let you create an online store by default, which is where WooCommerce comes in. By adding WooCommerce to your WordPress website, you can take advantage of an easy-to-use, customizable e-commerce platform. Setting up a store with WooCommerce is simple, as is dealing with payment, shipping, and other common tasks. You get most of the features you’ll need by default, and if you do want more options, there’s a comprehensive library of extensions that can help you out. What’s more, both the WordPress.org software and WooCommerce are completely free, as are some of the extensions (most of the others range from $29 to $299). 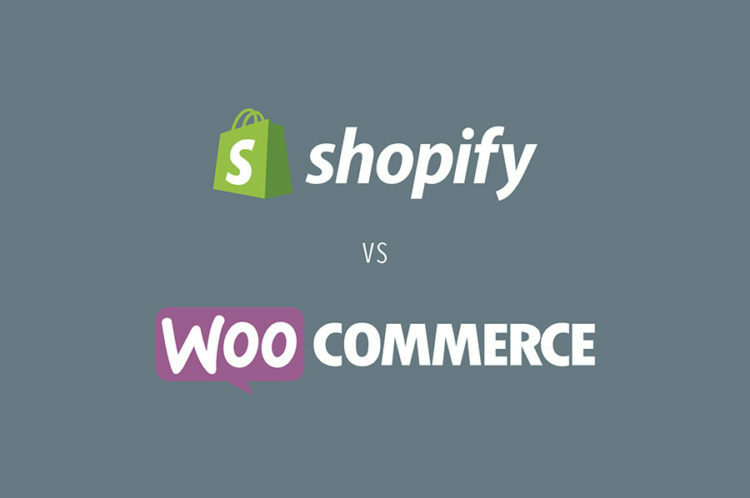 In case this isn’t clear yet, I’ll shout it on the internet: both Shopify and WooCommerce have a lot to offer! They’re beginner-friendly e-commerce solutions that provide all of the basics you’ll need to set up your store as well as a range of other useful features. But the question remains: which one should you use? Let’s compare these platforms on the six important criteria we introduced earlier to help you make that call for your website. With Shopify, you get access to an app store where you can add features to your e-commerce site. This first criterion is arguably the most important since your store will be lacking vital functionality if you can’t enable the right features. What does that mean? That it’s necessary to take a close look at the features both platforms provide out of the box, as well as those you can incorporate through higher-tier plans or extensions. 70 themes you can use as a basis for your store. Over 100 payment gateway options, a secured shopping cart, and multiple shipping and fulfillment options. Associated apps that help you run your store from a mobile device. A dashboard where you can analyze key data about your sales and customers. Ways to incorporate product reviews, discount codes, and coupons. Higher-tier plans offer additional features, such as professional reports and abandoned cart recovery. There’s also an app store where you can download add-ons that provide functionality such as social media, shipping, and accounting. The ability to sell services, physical goods, and digital products. A highly-customizable storefront with the option to create individual product pages and display variations. Features to help you track and manage inventory. A customizable shopping cart and checkout process, multiple currency options, and various payment gateways. Various shipping methods and zones. Functionality to handle product reviews, discount codes, and coupons. A mobile-friendly and translation-ready platform. Analytics features to track your traffic, earnings, and more. Since WooCommerce runs on WordPress, you can also add just about any feature to your store by using WooCommerce themes and WordPress plugins. There is also a store full of extensions you can download and install on your site, which will add new payment options (learn about payment gateways and transaction fees), shipping options, social media integration, and more. 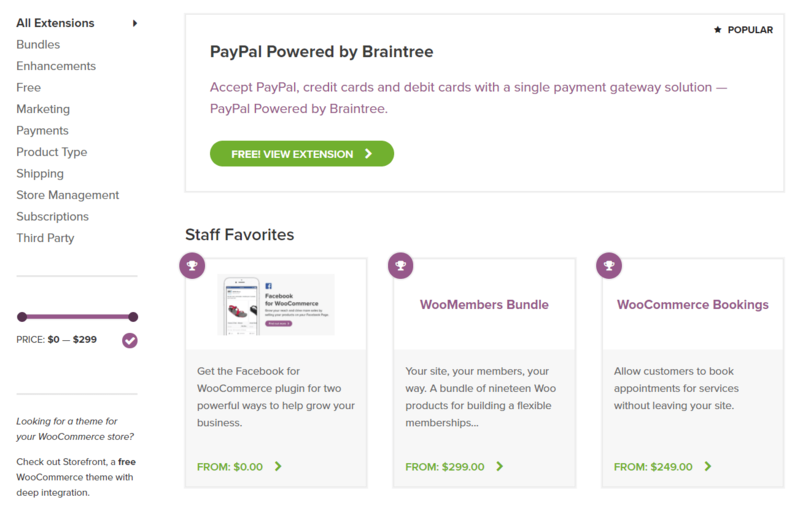 When it comes to features, both Shopify and WooCommerce shine. Each includes everything you’ll need and more by default and comes with ways to add specific extra features with little hassle. 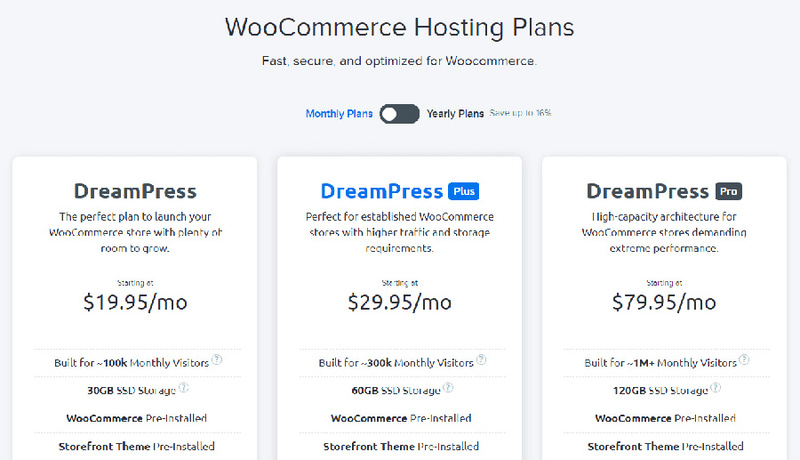 However, we have to give the slight edge to WooCommerce, simply because as a WordPress platform, it gives you access to thousands of plugins that can modify the functionality of both your store and the rest of your site. Much of WooCommerce’s flexibility comes by way of its various extensions. We’ve mentioned a few customization options in the features section above, but let’s dive a little deeper into the flexibility of these two platforms. After all, there are a lot of e-commerce stores, and if you want yours to be successful, it will need to stand out from the crowd. With Shopify, most of the flexibility you get is through its various themes. There are about 70 options (both free and premium) their own unique look and layout. Some come in multiple styles, so you can pick the version that’s best for your store. Once you choose a theme, you can customize it by changing the colors, fonts, and imagery to match your unique branding and vision. Certain themes come with additional customizable options, though most will not enable you to make radical changes. On the other hand, WooCommerce is a WordPress plugin, so it benefits from the flexibility offered by both platforms. With WordPress alone, you can customize just about every aspect of your site using themes, plugins, and coding if you’re comfortable with it. Plus, there’s a dedicated community that creates new content for WooCommerce stores every day. This includes hundreds of specific WooCommerce themes and plenty of independently-developed WooCommerce plugins. In short, WooCommerce is the clear winner here. Don’t get us wrong — Shopify is a fairly flexible platform. However, you can only do so much to alter the functionality and appearance of your site. With WooCommerce and WordPress, the sky’s the limit! Shopify offers a number of plans, so you can scale your store to your current needs. Most new e-commerce stores start out fairly small. However, there’s always a chance your store will grow over time. Regardless of your initial size, it’s smart to think ahead. You don’t want your store to expand to the point where your chosen platform is no longer viable. That’s why you’ll want to choose a scalable e-commerce solution. In other words, your solution should be able to handle your store no matter how small it starts or how big it gets. Shopify fits the bill in this area. Each plan has room for an unlimited amount of products and file storage. Plus, more expensive plans provide extra features that are useful for larger and more complex stores. This means as your store grows over time, you can upgrade to get exactly the features you need. There’s even a Shopify Lite plan with limited functionality for just $9 per month and Shopify Plus — an enterprise-level solution. As for WooCommerce, its scalability mostly comes from the access it provides to plugins and extensions. The core platform is already fairly scalable, enabling you to create just about any size and type of store (and site). However, it’s somewhat limited in options for aspects such as payments, shipping, and analytics. Fortunately, you can expand on those initial choices easily. For example, if you need more payment gateways, simply download and install a relevant extension or plugin. In our opinion, the platforms are neatly tied in this area. Shopify is somewhat more scalable, but that benefit comes at a greatly increased price. In contrast, WooCommerce is impressively scalable considering the core solution is free, and many of the plugins and extensions you’ll want or need are quite affordable. Security plugins such as Jetpack can be used alongside WooCommerce. Anyone running an e-commerce site should be very concerned with security. After all, you’re handling customer information, including sensitive personal data such as credit card details. If you want to keep your customers safe and promote trust in your e-commerce site, you’ll need to make sure it’s as secure as possible. Fortunately, both e-commerce solutions have put some thought into this requirement. Shopify stores, for example, are automatically PCI compliant. This means visitors can trust that their credit card information is kept secure. You can even display a security badge on your site to let customers know this. Plus, you can control user access to your site, and monitor your store for vulnerabilities and potential hacks through your dashboard. Finally, all plans include a free SSL certificate — a crucial way to ensure that all data flowing through your site is secured. WooCommerce also provides a number of important security features. For example, it’s built using good coding practices for ensuring security. However, the solution itself doesn’t need to do much, since WordPress itself is already fully committed to security. The platform sees frequent updates meant to address the latest concerns and issues. In addition, you can use plugins to ‘harden’ just about any aspect of your site. When considered as a part of the larger WordPress platform, WooCommerce definitely has the potential to be the more secure option. Shopify does come with more features out of the box, so it’s a safer bet if you don’t intend to take any extra steps. However, there are dozens of easy ways to tighten up the security of your WooCommerce site. You can add an SEO plugin, such as Yoast SEO, to your WooCommerce site to boost its rankings. If you aren’t familiar with SEO, it’s a collection of strategies aimed at helping your website rank higher in search engines such as Google. The easiest way to draw in new customers is through online searches. However, there’s a lot of competition, so if you’re going to get their attention, you’ll want your site to appear as close to the front page as possible. Shopify has clearly taken SEO into account and does a lot to help its users push their stores to the top. It automatically generates a sitemap, for example. You also get the freedom to customize your pages’ title tags, meta descriptions, and URLs and to set alt tags and filenames for images. All of these small tweaks help you better communicate the important facts about your store to search engine crawlers. WooCommerce itself is light on SEO-related features. It’s built using code optimized for SEO, but offers little in the way of related functionality or extensions. If you really want to improve your store’s chances of getting to the first page of Google, you can download a WordPress SEO plugin. There are plenty of free options that provide an entire suite of useful features via an easy-to-use interface — Yoast SEO is a perfect example. As with the previous criteria, which e-commerce solution is better for your site’s SEO depends on how much customization you’re willing to do. If you simply want to set up your site and avoid any additional work, Shopify offers a solid SEO feature set. On the other hand, WooCommerce and WordPress give you the best potential SEO boost, as long as you’re willing to go the extra mile. 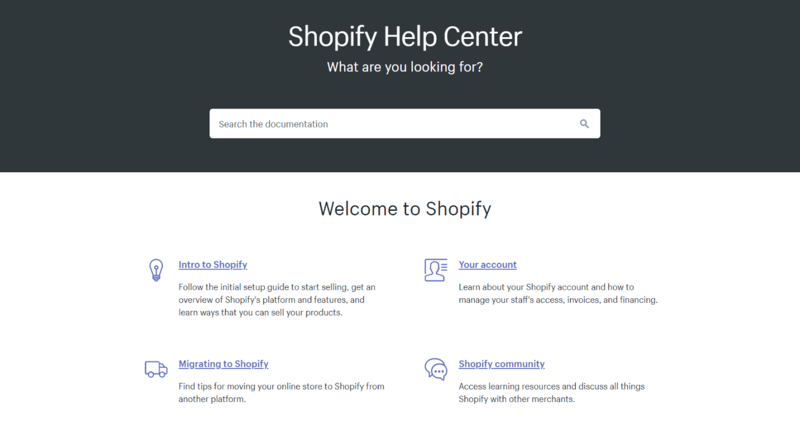 Shopify offers a dedicated help center to answer your questions and troubleshoot issues. Whether you’ve run an e-commerce store before or not, it’s almost guaranteed that you’ll need some help during the process. You’ll occasionally find yourself with an important question, or facing a problem you aren’t sure how to fix. That’s why your chosen e-commerce solution needs to provide solid support you can rely on. Since Shopify requires a monthly payment to use, it provides consistent support through various channels. There’s a comprehensive help center, where you can find everything from tutorials to troubleshooting guides. You also get access to 24/7 Shopify customer support via chat, email, or phone. Thanks to this platform’s popularity, there’s also a larger community to rely on and various additional support and learning options. These include more detailed training guides, forums, webinars, and more. WooCommerce offers many of the same options, including useful and detailed documentation. If you need more specialized help, you can submit a support ticket to the developers. Your main source of assistance and information, however, will be the WordPress community. You can easily find useful guides, training courses, forums, and more. If you’re willing to spend some money, you can even hire WooCommerce experts to help you with your site. Lastly, if you followed our advice about looking for a hosting provider with good support, you’ll be able to turn to them when technical issues arise. For this criterion, we have to give a slight edge to Shopify. Paying monthly for the service means you get consistent, reliable access to 24/7 support. WooCommerce has more potential support options, but you’ll need to do a little digging before you’ll find exactly what you need. Still, both e-commerce solutions provide more help and resources than you could probably ever use. Building an e-commerce site is like most things in life — the more effort you put in, the better your results will be. Taking the time to do a little upfront research and planning will help you build a thriving store and attract customers. If you want to start your store off on the right foot, you need the best possible tool to build it with. Shopify is simple to get started with and provides one comprehensive package that has just about everything you’ll need to build your site. You’ll have to pay a monthly fee, but the cost gives you access to plenty of useful features and reliable support. The platform is decently flexible and scalable, letting you customize your site to meet your needs and grow it over time. It also offers the most necessary security features, and even gives you some options for improving your site’s SEO. WooCommerce is a little more complicated to pick up, since you’ll first need to create a WordPress site, then install the e-commerce platform itself. Also, while it comes with an impressive suite of features, many of the options you’ll want for your store come by way of plugins and extensions you’ll have to seek out individually. However, with all the options available for both WordPress and WooCommerce, you get access to more flexibility, scalability, security, SEO, and support options than you could ever need. In short, these platforms are designed for different types of users. Shopify lets you build a store quickly and run it without any extra fuss. You can get a functional and reliable store off the ground with very little effort. In contrast, WooCommerce requires a bit more customization and thought. Still, it’s the superior platform for users willing to spend some time perfecting their stores, since it provides access to many more features and add-ons than Shopify. And the ultimate plus for WooCommerce and WordPress? You can rest assured that you own your online content when you’re using open-source software and self-hosting. Because when your store lives on your own personal website, you don’t have to stress about the platform changing, being sold, or losing your data. As a website owner, you’re in complete control — with the exclusive rights to use your content to make money online, grow your audience, or prove your expertise. What’s been your experience with Shopify or WooCommerce? Do you have a preference? If so, why? Join the DreamHost community and start the conversation!